The Garage Grooming Shop, located in picturesque Sylvan Lake, Alberta, at 4602, 43 St.
From puppies to senior dogs and everything in between. Pet trims, show trims and creative styles are available. A style can be created to fit your lifestyle by a groomer with over 18 years experience. I have a special puppy program which took me 5 years to develop. It is one of the most successful programs to teach puppies the ins and outs of looking good and smelling great. Senior dogs can be challenging, but, I don't stress the old ones. If it takes longer, it takes longer. As long as they leave happy and clean, I'm happy. For canines in between, pet and show styles are available as well as a combination of both. I no longer take giant breeds such as Great Pyrenees unless they are on a smaller scale. I can get them in my tub, but my tub isn't wide enough to allow them to turn around. Because of this, I am unable to give them a thorough bath. I apologize, but I just can't accommodate dogs of this size at this time. I ask that if your dog is sneezing, coughing, vomiting, has diarrhea, has stopped eating for more that 2 days to go to the vet. Please don't bring him in the shop where he could infect other dogs. If you suspect that your dog has fleas, mange or other contagious skin conditions, please discuss this with me at the time of making the appointment. I can arrange to have the dog in a quarantine situation without other dogs in the shop. If you have a dog that has been booted out of other salons, please tell me when booking the appointment. I regularly rehabilitate challenging dogs, but I require that I know, so I can book extra time for the dog. It is the clients responsibility to tell me if your dog has ever bitten or nipped someone. If you want to bring a picture of a style for your pet, please do. I can go over the picture and advise you if the style will be able to be applied to your pooch. Lions, panthers and lynxes frequent The Garage. Mohawks, stegosaurus or puss 'n boots. Only your imagination will hold you back with your feline. 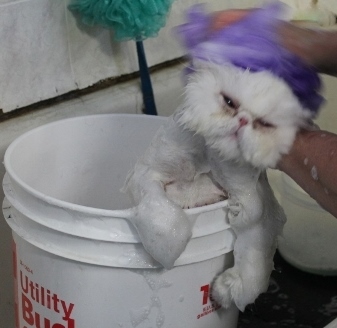 Cat grooming is not for the faint of heart. Is it fun, exhilarating and fast. Cats have a timer and unlike their canine counter parts, when their timer goes boom, there is no calming them down. I prefer owners stay for the first few appointments as felines are more relaxed when the owners are present. If you want the option of dematting, depending on the severity of the matts, it can be accomplished. 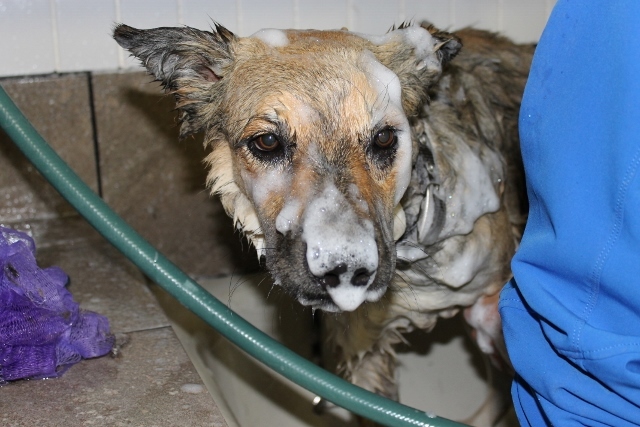 Regular brushing and bathing services are also available. I also offer a sanitary trim (bum and tummy). Felines are by appointment only. In some cases, I will hold the cat all day, but it must come with its own kennel. I try to have the cats come in after the dogs have gone home, but occasionally we do have a cross over where there are dogs in the shop at the time of your cat appointment. The dogs will have the doors covered to hide them from the cats and 98% of the dogs have been taught to be quiet in the shop. I have never had an issue. Let a master cat groomer discuss your cats needs. The Garage Grooming Shop is a low stress salon. I work according to the dog, this means that if your dog takes a little longer to be groomed, its because the dog needed the extra time emotionally. If you want a shop that will styles your pet in the fastest time possible, this is not the shop for you. Some days, your pet will be done fast, some day he won't. If you own a high maintenance dog, but choose to only have it groomed once a year and allow it to become a pelted mess, this is not the shop for you. I only take a maximum of 6 dogs a day and 1-3 cats (after the dogs are done). This allows me to spend quality time with your pet. I have morning drop offs and afternoon drop offs available. For mornings, the dogs need to be dropped off between 8:30-9:00 am, for the afternoon, 1:00. Earlier drop offs or late pickups are available, but must be arranged at the booking of the appointment. Payment is due upon collecting the pet. If you have any questions, ask. I am very eager to educate owners and will try to the best of my ability to advise owners the best way possible. My current clients are amazing, as are their humans. I have some of the best people and pet clients around and I treasure them. We have laughed, cried and cheered each other on. I feel honored to have such special clients.